 In 1925, Pirandello--at age 58 entering the final decade of his life, his wife confined to a mental asylum, his beloved daughter in Brazil--fell in love with a 25-year-old actress, Marta Abba. From 164 of the 522 letters Abba donated to Princeton University Library before her death, Ortalini (Theater/Brooklyn College) meticulously represents Pirandello's obsessive involvement. As he explains in an exhaustive and occasionally feverish introduction, in a scrupulously detailed chronology, repetitive introductions, intrusive footnotes, and an excessively particularized index, the letters reveal Pirandello's suffering, anguish (``see also Depression/Anxiety, Despair''), his dream of a national theater, the perfidy of his ``enemies'' (other playwrights), and his financial difficulties. They also reveal his insomnia, his various physical complaints, his changing attitude toward the art of film that at various times inspired and revolted him, his business dealings, his restless relocations from Italy to Berlin to Paris, England, America, and his growing international reputation that resulted in a Nobel Prize, a private audience with Mussolini, who resented his travels, and the vast amount of money he seems to have made in spite of his complaints about poverty. He offered frequent apologies to Marta, a busy and successful actress, for his obsessive pursuit in what was to remain an unconsummated and unrequited affair. He also reveals a manic side that the editor overlooks, an egomaniacal belief that God is on his side, having put ``true eternal youth'' in his blood, heart, brain, and that he will write great words that will ``astonish the world.'' 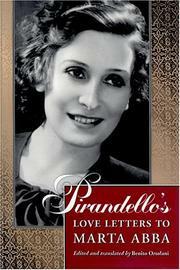 In these letters, Pirandello is rarely a lover, more often a case, a pathology, in which love is incidental. He displays the whole range of symptoms, the misery, euphoria, obsession, self- involvement, instability, that Freud suggested the creative personality suffered as the price of his art, the torment and energy behind the ostensibly antic Six Characters in Search of an Author.